Jagodzianka or Jagodzianki (in plural) are traditional Polish sweet buns filled with blueberries or blueberry jam. They are often topped with a sweet crumbs that works perfectly with taste of sour blueberries. Blueberry buns make perfect picnic food as well as summer breakfast and lunchtime snacks. As a child I used to pick blueberries during summer holidays in Masurian Lake District to make some pocket money. My hands were all purple but I never got fed up of doing it. During blueberry season we used to eat everything with blueberries, from raw blueberries with sugar, through cold blueberry soups to pierogi filled with blueberries and topped with soured cream. I don’t recall baking jagodzianki but they were always available in bakeries and they were my favourite, just next to the cheese buns, of course. If you are looking for more traditional Polish recipes take a look at our Polish section or follow our Pinterest board – Made in Poland. Please note that blueberries in Poland are nothing like blueberries found in UK (we call those American bilberries) but much smaller, with intense bluish purple colour on the inside and outside and aromatic and tangy flavour. They grow in the wild, in the forests across Poland. To make the dough combine lukewarm milk with sugar and yeast, leave aside until it will double the size. Then add milk and yeast mixture. Share the dough into 12 equal pieces, turn each piece into a ball. Leave the buns again to grow for about 30 minutes. In meantime prepare the crumbs by mixing all of the ingredients with your fingers until the mixture will turn into crumbs. Use your finger to make hole for the filling. Stuff each bun with jam and blueberries and then seal. Place buns in the oven preheated to 160°C (320°F) and bake for about 30 – 35 minutes or until golden brown. Half way through the baking brush the buns with egg yolk, sprinkle with crumbs, then return them to the oven. Let the buns cool down properly before serving. If you can’t find sour blueberry jam, replace it with blackcurrant jam. It will work better with sweet crumb topping. Store buns in air tight container and they will still taste great the next day. I’m adding this recipe the Inheritance Recipes link-up that we co-host together with Solange of Pebble Soup. 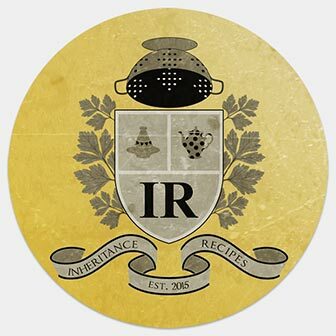 August Inheritance Recipes is hosted by Solange, please come and join us, share your inherited recipes! If you are looking for more ways to use up blueberries, take a look at Camilla’s Rhubarb & Blueberry Tarte Tatin, Emma’s Scandinavian Oven Baked Pancakes with Blueberry Compote, Grace’s Yogurt Fruit Pizzas, Lucy’s Slow Cooker Blueberry Madeira Cake, Helen’s Blueberry and White Chocolate Chip Cupcakes, our Sugar-Free Minty Blueberry Milkshake or Octonauts Cake with Blueberries. These look delicious Margot! I do love a sweet bun and like the crumbly top. We grow our own blueberries and interestingly they are much sweeter than the ones found in supermarkets! I always find them quite sour. I must really have a sweet tooth! Interesting to know they are even more sour in Poland! I wonder if it’s to do with the amount of sunlight they get in the forests? Your entries are always mouth watering. I will be trying this out without any doubt.